7.How to perform with OnePageX Transactions? 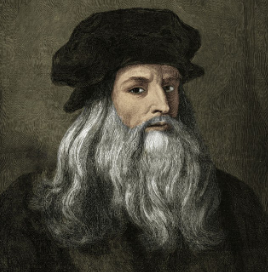 “Simplicity is the greatest sophistication” Leonardo Da Vinci (1452–1519). This phrase attributed to Leonardo da Vinci for many considered one of the most influential people of humanity with a different approach to how to see the world and great works like the very Gioconda. Da vinci teaches us that Simplicity should be the formulation of our strategy. The key ideas should be clean as a spring morning if we want to disseminate them and that they are understood and put into practice by the people of our organization. In an increasingly technological world where changes in paradigm and uses of platforms vary by leaps and bounds. Simplicity plays a very important role and the use of cryptocurrencies does not escape from it. There are many platforms and web pages that currently exist to carry out transactions of different types of cryptocurrencies, generating doubts in the population that has not yet fully adapted to this new economy, causes a lot of uncertainty in the terms and parameters to make one of the different virtual purses that currently exist. Currently in the process of transferring and transactions of cryptomoneda requires a process that could be called tedious and in some cases complicated, where almost always the first step requires a registration by the user delays a lot the process for those of fast marena and effective you want to make transactions. This is where ONEPAGEX appears, being the simplest cryptocurrency exchange currently with a wide selection of cryptocurrencies. Its name comes from the abbreviation of OnePageExchange. Whose vision is to simplify the process of trading and converting cryptocurrencies. Simple since it does not require registration, the user Each time it generates a transaction, its URL will be added to a “session”. Simply by marking the page or copying the link to return to it. The generated addresses can be used indefinitely, and you can also return to view the status of your transactions! WHAT DIFFERENCE OnePageX from the other platforms is that it DOES NOT REQUIRE ANY REGISTRATION. Simply choose the cryptocurrency of your choice and start! Another unique feature of OnePageX is that users are not limited to a few selected cryptocurrencies. They can make use of more than 140 available cryptocoins. 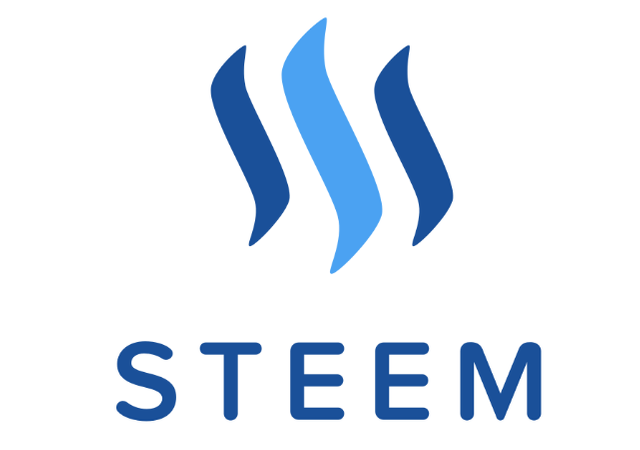 The STEEM, a very popular cryptocurrency that is increasingly increasing its popularity among users of virtual wallets will be implemented soon allowing the users of this platform to make use of OnePageX and streamline their transactions. 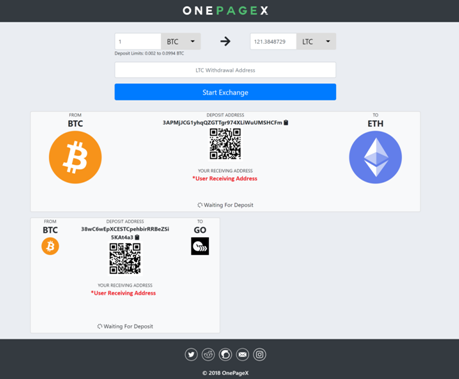 In line with maintaining the simple interface, OnePageX allows multiple transactions from one page. Transactions are added in the form of cards that users can return and use at any time. Transaction cards indicate the status of each transaction. This is to provide the user with an accurate idea regarding the status of their transaction. Bitcoin sent, waiting for 2 confirmations. The exchange is complete! Starting the retreat. Complete retirement! The transaction is made. Another great advantage of OnePageX is that the transaction time is almost instantaneous once the deposited currency is confirmed. To ensure faster exchange rates, use the appropriate rates when sending Bitcoin. OnePageX has a widget that websites can implement simply by copying and pasting a fragment. This will allow websites to provide their users the ability to make rapid exchanges of cryptocurrencies!